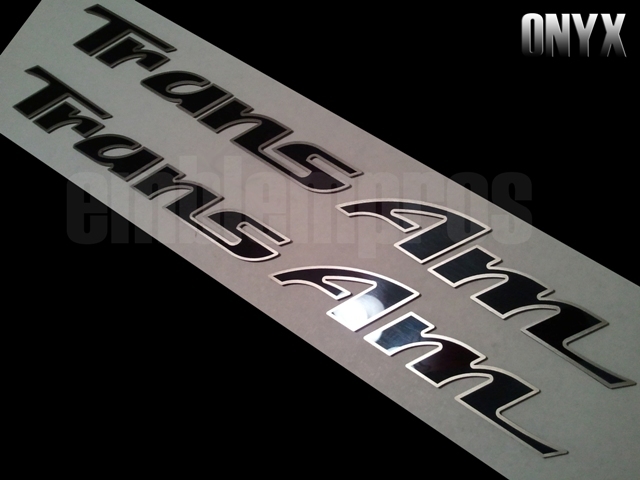 1993 - 2002 TRANS AM DOOR EMBLEM OVERLAYS, Premium black mirror stainless steel - our ONYX Series. Very High Bond 3M emblem adhesive is pre-applied to the backside of each emblem. Fits nicely over your factory Trans Am emblems or they can even be used as a complete replacement based upon what look you like. Two full texts included, one for each side of car. NOTE: This set is also available with a satin silver perimeter etching seen HERE for an additional fee. Just check the box below for the upgrade.